Dr Llewellyn graduated with a Bachelor of Science with Honours and a PhD, from the Australian National University, Canberra, ACT, Australia. At the time it was a tedious, often hit and miss process, but now we can routinely add new genes to a range of crop and model plants or to turn off specific plant genes and the GM technique has become fundamental to many new discoveries in plant science that will be our future GM traits. He pioneered the use of GM plants to study how the expression of plant genes are controlled, particularly during periods of stress, as well as in the improvement of the agronomic performance of agricultural crop plants, particularly cotton. He has been involved in the cloning and analysis of alcohol dehydrogenase and other genes expressed during waterlogging in plants. Dr Llewellyn has also been involved in the discovery and analysis of plant haemoglobin genes (some of which are involved in the waterlogging response) and how their expression can be manipulated to improve performance of crops whose roots become flooded. 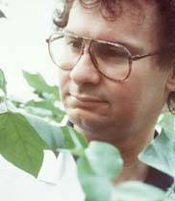 He has been involved in dissecting the genes that control cotton fibre development using modern genomic tools and techniques to compare global gene expression profiles between different cotton genotypes that produce different numbers or types of fibres and has resulted in the identification of a number of master regulator genes (transcription factors) essential for the production of the fibres on the cotton seed. He has pioneered the field evaluation of transgenic cotton working closely with researchers, companies and regulatory agencies to evaluate and deploy new GM traits into cotton production in Australia. Danny Llewellyn led CSIRO’s research into the application of biotechnology to the improvement of cotton production. He has played an important role in developing the insect and herbicide tolerant, genetically modified cotton varieties which currently dominate the cotton industry. Dr Llewellyn’s research into the molecular control of cotton fibre development may lead to the production of novel GM cotton varieties with improved fibre quality characteristics and help maintain the competitive position for Australian cotton in the global natural fibre market. Catizone I, 2009, Personal communication. Science Image video: 2003 Chairman‘s medal.